Being present has always been difficult for me during times of stress. Now I discover that it can also be triggered by happy occurences too. I do not want to live in my head as there is only one life to live so I endeavor to be more present and awake despite whatever else may be occuring in life! I awoke angry this morning, every muscle tense. Then, I heard the rain coming down. 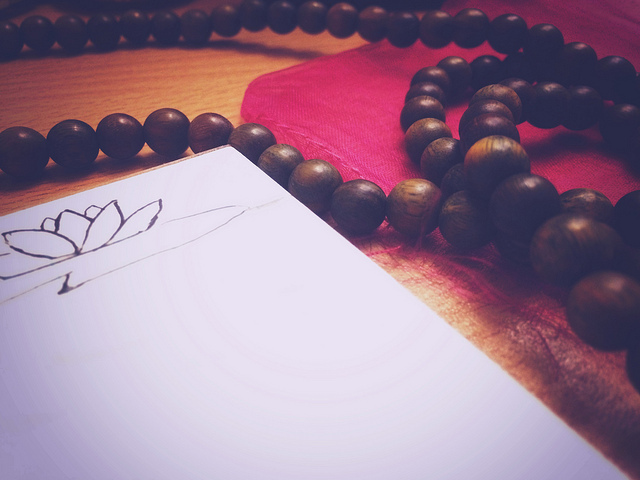 I sat up in my bed and took out my mala beads and decided to meditate. I wanted to feel gratitude for something in my life with each of the 108 breaths, as I often do when meditating, but it didn’t happen. Instead, I felt immense gratitude for my feelings of anger, gratitude, my recent reconnection with music, love, happiness and the ability to feel so. I also felt aware of the rain, cold and warmth and it made me smile. I feel so grateful that five minutes of meditation brought me back to joy and feeling a bit more relaxed. I reminded myself that every time I feel frustration today, I can and will come back to this place of peace. It’s not healthy, but usually when I get angry, I become angry at myself for being angry. Over time, however, I have discovered how protective anger really can be. It has saved my life at least once. The fact that I feel it means there is something in my life I need to let go of unless I want to get hurt. Time to walk away and do it with an appreciative and happy smile.